Nick Paton Walsh articulated it well: “The role [Turkey has] taken is not that of the virtuous prosecutor, but of the exploitative politician,” he wrote on October 18 about Ankara’s handling of, what at the time was considered the disappearance of Saudi journalist and insider Jamal Khashoggi. Why do we still know so little, he asked at the time, before Saudi Arabia had admitted to the murder. “The slow, purposeful, yet absolutely deliberate series of leaks to the media of evidence pointing towards the involvement of the Saudi Crown Prince and his immediate entourage has been disrespectful to the cause of justice itself, let alone to Khashoggi’s grieving relatives.” The BBC’s Mark Lowen identified the trend even earlier on October 10. “drip-feeding leaks on Khashoggi to pro-govt media: pics of 15 alleged members of Saudi hit squad, CCTV showing them arriving in Istanbul, checking into hotels near Saudi consulate, vehicles going from consulate to CG residence, jets leaving. Doesn’t look good for Saudis.” Deborah Amos at NPR also noted it on October 12. Many have now come to understand that there is a strategy to the method by which leaks have been made in Turkey. Western media and commentators have gone from hanging on every outrage over the murder to wondering whether the various stories of “tapes” and other details will actually materialize. Yet they continue to stay tuned for every juicy detail. On October 23 when SkyNews suddenly claimed a body had been found many people who should know better began tweeting. On October 18 the Associated Press noted that at each turn of the investigation “Turkish officials leaked more shocking material to the media, making it impossible for the journalist’s alleged murder to be quietly swept under the rug.” It is an “art” some have said, to be able to provide leaks everyday like this. When the Turkish president was going to speak on October 23 many thought that major new details would be revealed. Martin Chulov tweeted “A huge moment in the region looms, as Turkey’s President prepares to disclose what he knows..Khashoggi case has put Saudi prince right where Erdoğan wants him.” After the speech many were left wondering why Ankara’s public statements were much more sanitized then the private leaks. At every turn salacious details, often unverified, became fact. Many of these began in the Turkish media or were ascribed to Turkish sources, sometimes official or unofficial, sometimes to various members of the police or government. 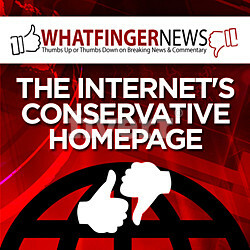 It was difficult to verify what was officially known, versus rumors. BBC tried to create one timeline. After Khashoggi disappeared on October 2 press reports began to emerge the next day. However it took several days for the leaks to begin. We may not know why it took several days, since according to the later accounts the existence of an “audio” tape would have immediately provided authorities knowledge of what happened. Later it would emerge that officials did try to rush to the airport on October 2. October 15: “The security official…said the recording obtained by Turkish police has 11 minutes of audio. Technical voice analyses conducted by police identified three male voices who are believed to be Saudi’s, in addition to the voice of Khashoggi”. 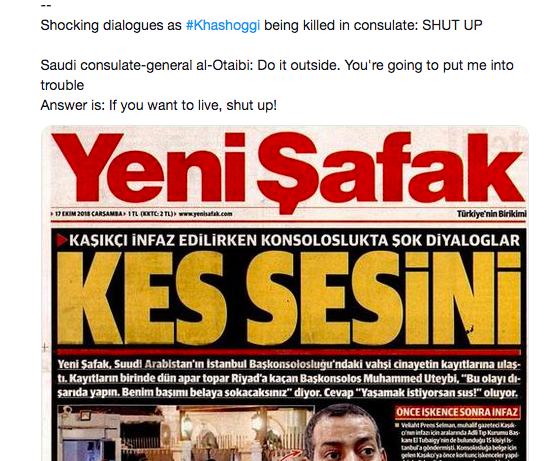 October 20: “Sources tell CNN that the Turkish intelligence agency MIT decided to review an audio-visual feed from inside the consulate — a feed whose existence Turkey has not publicly acknowledged.” October 20: “Jamal Khashoggi was strapped to a table and dismembered alive by Saudi Arabian henchmen on October 2. His blood curdling screams were broadcast to the outside world on his Apple Watch for the seven minutes it took to kill him.” CNN: Turkish officials suspected Khashoggi had been killed within hours, went to airport. 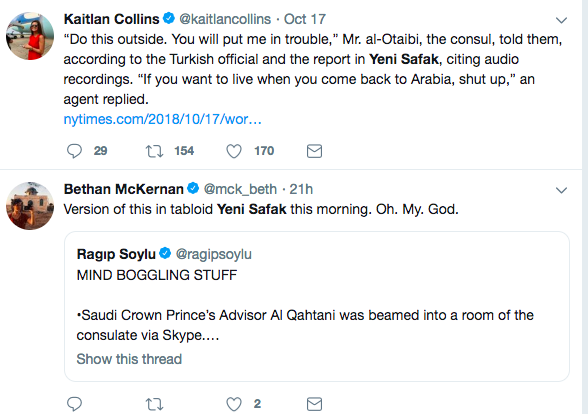 October 21: “Pro-govt Turkish newspaper Yeni Safak says when Khashoggi entered Saudi consulate, Crown Prince Muhammed bin Salman rang him personally & asked him to go to Riyadh. Khashoggi refused. Within seconds of putting the phone down, his butchering & murder began.” October 21: Saudi crown prince spoke to Khashoggi before he was killed. Analysts and reporters have now begun to call the leaks in Turkey as a form of “drip drip” feeding of the story. Bloomberg published a piece arguing that Turkey’s leaks were harming the investigation. Thomas Juneau, who followed the case from early on, “The constant drip-drip of information coming out of Turkey on the Khashoggi case is fascinating (and of course it has to be taken with a truckload of salt). It shows how Turkey is the major leagues and Saudi the minor leagues in terms of crisis management skills.” Kyle Orton argues that “Incidentally, this might explain what Turkey is actually doing: the drip-feeding of this story might not be intended to extract something from #Saudi, but to build an audience for Erdogan to deliver a serious blow to MBS and US-Saudi relations tomorrow.” One man even postulated that a thesis might be written on this tactic. “One can write a whole thesis about Turkey’s mediatization of Khashoggi case, the ways in which Turkish media’s slow but steady drip of leaks (intelligence) created the conditions of possibility for TR to bring the US on-board while seeking to drive a wedge btw US-SaudiArabia!” And it appeared to be working. “In less than two weeks, Turkey’s “slow drip” strategy has forced the Saudis to move from denial to admission,” wrote Ragip Soylu on October 19. Carlotta Gall at the NYT agreed. “In Khashoggi Case, Turkey’s Slow Drip of Leaks Puts Pressure on Saudis.” It kept it in the news everyday. Geostrategy or just a confluence of interests? The strategy is portrayed as some kind of genius Machiavellian Sun Tzu technique of geostrategy. A piece at the Washington Post noted “Turkey has controlled the narrative of Jamal Khashoggi’s death with a steady drip of leaks.” The Wall Street Journal aslo reported on October 22 that “Turkish authorities embraced a strategy to leak evidence slowly in the days after Jamal Khashoggi’s killing, to blunt Saudi Arabia’s international standing.” Who has been running or orchestrating the “drip drip” or whether it is orchestrated remains a clear question. That major media are all not analyzing the “drip drip” method and some have begun to wonder about the claims made over the course of the case, there is a chance the “art of the leak” may backfire. If journalists who passionately care about this case feel they have been played, or they feel Turkey is making a behind-the-scenes deal, they may turn their ire on Ankara. Many western journalists took this case seriously for a variety of reasons. Some felt the Saudi crown prince was out of control or that US President Donald Trump enabled the killing through a close US alliance. Others were angry because they were close to Khashoggi or felt targeting a journalist crossed a red line. All of this means they are not driven by an agenda to support Turkey. Turkey happens to be the place where the murder happened and insofar as Turkey appears to be doing the “right thing,” it will receive support.